If you’re moving to Germany, you can look forward to some pretty nice weather. It’s rarely hot in summer, but it can get quite cold in winter. Much of the country is mountainous, you know. So when winter rolls around, you’ll want to bundle up. 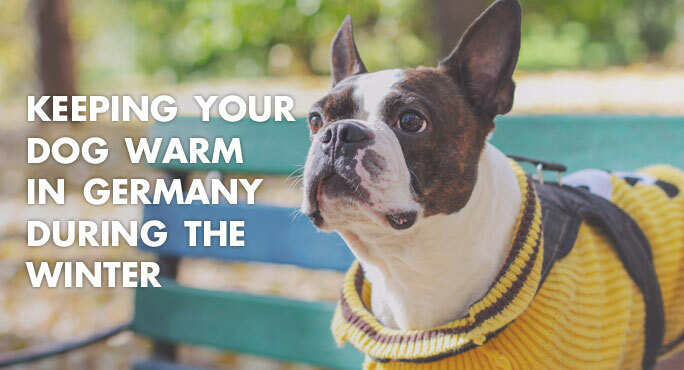 You might want to bundle up your dog, too – or at least make other preparations to keep him toasty no matter the temperature. Protecting your pup is important, because over-exposure to cold can cause painful frostbite and hypothermia, which can be deadly if not caught in time. With that in mind, if your relocation to Germany will actually take place during the winter, talk to us here at Starwood about how that could affect your dog’s travel plans. Especially if you’ll be living in the eastern part of Germany, you can count on snow in winter. In Bavaria and Munich, it sometimes snows in early April. Throughout most of the country, daily average winter temperatures run around 0o C. (That’s 32o F. If you aren’t used to “thinking Celsius,” now is a good time start practicing those conversions!) But that’s the average. When weather patterns come into Germany from Siberia, you could see temps drop to -15o to -20o C (a few degrees below zero Farenheit). Brrrr. If your dog is a Husky, he’ll think he’s moved to heaven. He has that nice, heavy double coat of a northern breed. However, if your pooch is a whippet with a super-short coat, he’s going to feel the cold in a big way, perhaps when the temperature is still as “warm” as 45o F. PetMD recommends taking precautions for “at risk” dogs any time the temperature will drop below freezing, and even for the heartiest of dogs when it’s 20o F or colder. It’s not only fur thickness that affects whether dogs get cold. Dogs who are small, very young, older, or suffer from some chronic health condition are less able to regulate their body temperature to stay warm. In the case of small dogs, the problem is physics, not health – they simply have a higher skin-to-body-mass ratio, so they lose body heat faster. On the plus side, dark-colored dogs can absorb more heat from the sun during the winter. Regardless of these other factors, if your dog is used to living where it’s cold in winter, he’ll be able to adapt to the climate in Germany faster than if he’s never had to contend with the cold. Keep in mind that your pooch may stay comfortably warm during active outdoor activities, but he’ll cool down quickly as soon as you stop. If it’s truly cold, consider forms of exercise you can do anywhere, including indoors. How Can You Tell If Your Dog Is Cold? You wear sweaters and a coat in winter, and so should your dog if he’s likely to get cold. There are lots of fun and functional products to keep him warm, literally from head to toe. Aside from sweaters, you can find cape-style padded coats that keep the torso warm and even styles that have detachable leg “coats” as well. You can also outfit your pup in warm headgear or warm, waterproof traction booties. Trim the fur between his paw pads, so it doesn’t collect “snowballs” when he’s outdoors. That accumulated snow is not only cold, but uncomfortable. When you’ve been outdoors in the rain or snow, towel your dog dry as soon as you come inside. Rinse his feet in warm water, if there is any chance he might have stepped in some snow melt product, because these chemicals can be toxic. (He might like a soothing rub with paw balm, too.) And make sure he has a warm, cushy bed indoors.